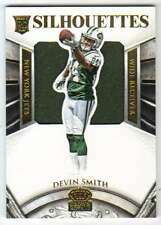 Player: Devin Smith. 2015 Panini NFL Football Cards. Year / Season - 2015. Year: 2015. 2015 Football Cards. Team: New York Jets. Manufacturer - Panini. Card Manufacturer: Panini. Player: Devin Smith. 2015 Panini NFL Football Cards. Year / Season - 2015. Year: 2015. 2015 Football Cards. Manufacturer - Panini. Print Run: 99. Orders are sent economically. We put all cards in a Penny Sleeve, Top Loader and Sealed in a Team Bag. SHORT PRINT AUTOGRAPH / JERSEY PATCH ROOKIE CARD! #FRAP-DS (SP #d 15/75). ALL CARDS AREMINT/NR-MINT CONDITION! You will get all cards pictured which include. LOT # B325 and 326. Player - Devin Smith. This is number 30 from the set. This parallel set is a rarer variation version of the base set. Player: Devin Smith. Year / Season - 2015. Find More 2015 Fire Football Cards Here! You will receive the card that is pictured and described in the item title. DEVIN SMITH. 2015 Prestige Football. Rookie Autograph #231. New York Jets. Autographed Rookie Card. Anthony R. Prudom. I always strive to be both understanding and patient. This is number 30 from the 50 card Rookie parallel set which highlights 2015's Top Rookies. Player - Devin Smith. Player: Devin Smith. Year / Season - 2015. Find More 2015 Fire Football Cards Here! Year: 2015. Player: Devin Smith. 2015 Panini NFL Football Cards. Year / Season - 2015. Year: 2015. 2015 Football Cards. Manufacturer - Panini. Card Manufacturer: Panini. Breaking cases of every new set across all major sports as well as many non-sport and even more obscure releases. 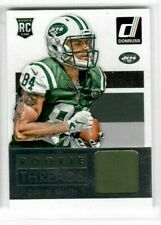 UP FOR SALE IS A... 2015 High Tek #38 Devin Smith Autograph Gold Grass Waves RC 21/50 and Contenders #INK-DS Autograph Rookie Ink 22/199 (Lot Of 2) of the New York Jets Please see scan for exact condition. Card has been stored in a penny sleeve and toploader and kept away from the light. Only taken out of protection to be pictured so you can see any imperfections when buying. Card will be shipped in a toploader and team bag packaged securely inside of a bubble mailer shipped via USPS. Rookie Jumbo Patch Autographs Devin Smith. New York Jets. DEVIN SMITH - RATED ROOKIE. CARD - CARD NUMBER # 213 --. HIS CARD IS IN MINT CONDITION AS ALWAYS . CARD IS SERIAL #'rd 80/99 ! 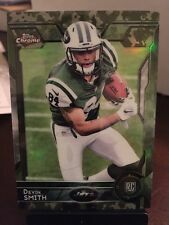 2015 Panini Prestige Rookies Extra Points Purple #231 Devin Smith Serial Numbered to only /100. Player: Devin Smith. 2015 NFL Football Cards. Year / Season - 2015. Year: 2015. Team: New York Jets. Manufacturer - Panini. You Will Receive The Card As Pictured. DEVIN SMITH 2016 PANINI PRIME SIGNATURES "PRIME SIGNATURE AUTO" #'RD ! CARD IS SERIAL #'rd 56/99. 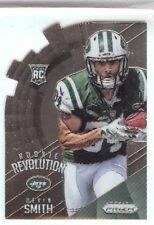 Card was pulled and placed directly into sleeve, top loader and team bag.